Have I mentioned I’m working on an indie RPG? Yes, I have. One of these days this site is going to morph into a more traditional dev blog where I talk about the mechanics of my own project. That transition begins now with a focus on the games that are heavily influencing the design of mine, which means first and foremost Chrono Cross. I’m going to be taking an extra-close look at that game’s systems in the posts to come (which I intend to write more frequently (ahahaha)), starting today with an overview of the high-level decisions CC’s designers made in the service of streamlining the RPG genre back in 2000, and what I’m taking away from them. To a genre veteran this is the most glaring difference: the concept of experience points is totally absent. Rather than gaining a level after meeting some numerical threshold of XP, Chrono Cross characters only level up after defeating a boss. After each new growth level is earned, the next few battles will earn the party small stat increases, but soon there is no benefit to grinding other than the items dropped by enemies. This choice allows the designers to know the exact power level of the party at every point of the game, so if a boss seems particularly difficult, we can assume that it is intentionally so. This amounts to a rejection of one of the genre’s fundamental assumptions, that the player can overcome any obstacle by investing more time into the game. Grinding – fighting “unnecessary” battles for the sole purpose of gaining levels – allows players to adjust the game’s difficulty to compensate for differences in skill. Individual players’ preferences differ as to how much grinding the ideal RPG requires, and CC is clearly catering to the subset whose preference is “none.” There is an enormous difference, however, between a game that doesn’t require grinding and a game that doesn’t allow grinding. Am I preserving this idea: No. CC is an overwhelmingly story-driven game and I’m making something more in the vein of a dungeon-crawler. I’ll be carefully calibrating how much combat is “necessary” for the critical path, but there has to be a reward for pursuing further battles. These days random encounters are more the exception than the rule unless the game you’re playing is by Atlus, but avoiding them was fairly special when Chrono Cross was released. The closest thing to a battle that you don’t initiate is an enemy dropping on you from the ceiling as you walk down a corridor. Am I preserving this idea: Yes. I am not Atlus. 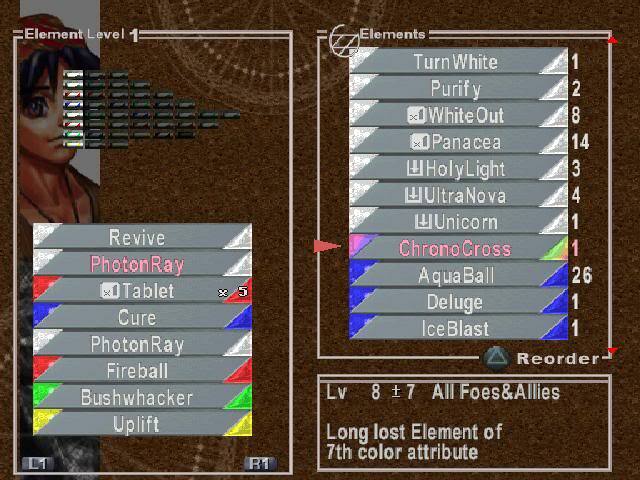 Left side: Characters in Chrono Cross briefly earn small stat bonuses from normal encounters, but overall growth is strictly gated by boss battles. Right side: “free” healing with the battle resources you didn’t use is one of the most player-friendly features of the game. You can escape every single battle in Chrono Cross, guaranteed, with no penalty other than whatever health was lost in the course of battle. You can’t necessarily run off to a different area – boss fights usually begin again immediately after allowing you time to heal and reorganize your party – but even the final boss can be aborted and restarted as many times as desired. Few other RPGs are this player-friendly when it comes to fleeing combat – in fact a fair number of games don’t give you the option at all – but that decision makes complete sense in light of the importance of tailoring your party composition and Element (spell) loadout to each new area and boss encounter. Having mostly blue Elements equipped and discovering that the boss you just started fighting is blue should prompt you to immediately back out and retool with more red Elements, and maybe a red party member for better overall damage. Guaranteed escape is essentially of a piece with the decision to remove experience points: if you get into a battle that’s over your head, your only recourse is to change your strategy, not to become more powerful by grinding. Without the ability to freely retry battles with a new party configuration, the game’s strict adherence to a single difficulty curve would be much too punishing to less skilled players. Am I preserving this idea: Yes. Not just for the reasons that CC allows it, which will all (hopefully) be reflected in my game, but also because the world will probably be more open to exploration without going through story bottlenecks, which creates the possibility of being surprised by encounters far above your level. 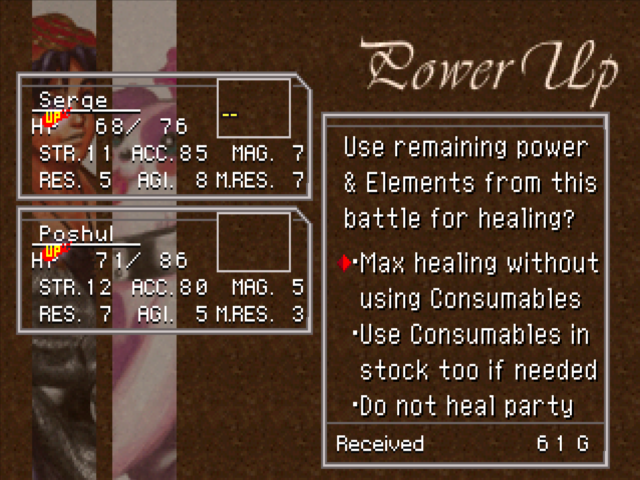 If it would have been possible for you to spend a few extra turns casting healing magic before delivering the final blow of a battle, Chrono Cross gives you the option to do it after the fact. Because Elements are only usable in combat, this allows for the most efficient healing possible, reducing your dependence on consumable items to survive in a dungeon. There’s no downside to this player-friendly affordance, as it’s simply automating a process that would be entirely within the rules to do manually, but also entirely tedious. CC in general is not interested in attrition over time, which is a mainstay of RPGs. Whether it’s called MP or SP, most games have some resource which will run out if you go too long without returning to a safe zone, putting a leash on your range of exploration that can be extended over time through leveling up. As with the absence of grinding, CC doesn’t intend for you to repeat content, so you’re likely to make it through each dungeon without having to back out and resupply. Am I preserving this idea: Maybe. Probably? Yeah probably. There’s other ways of using “magic” outside of combat, so it’s not quite as vital, but I may end up carrying this feature over just in order to disincentive the tedious alternative behavior. Remember: If the most efficient way to play your game isn’t fun, your game isn’t fun. 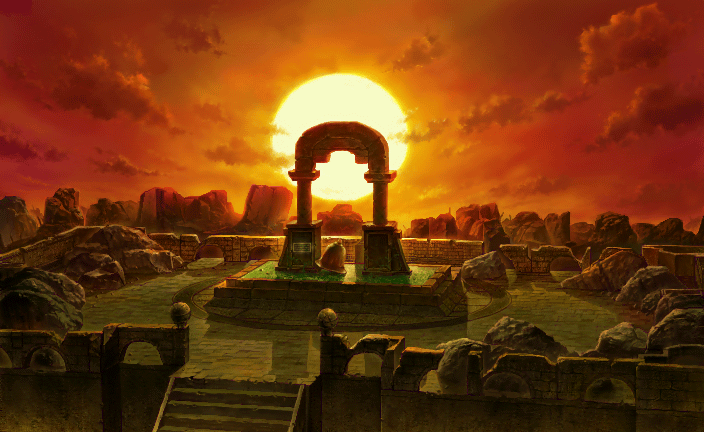 This is where Chrono Cross starts getting into trouble. The reason that the automated healing shortcut exists is the rules governing the use of magic: each Element can be used once per battle, by spending points earned from successful physical attacks. This means you start every battle fresh – no attrition as you explore – but that also means that over time, as battles become longer, the only way your party can have enough magic available is for the number of Elements you carry to increase more or less linearly with your level. By the end of the game each character has a few dozen Element slots. As far as combat goes, this is fine. The Element management interface outside of combat, however, is an unmitigated disaster – by far the game’s worst flaw (putting aside whether the narrative stylings of Masato Kato are to your personal taste). Replacing just one of these Elements when you have pages and pages to scroll through is painful enough; swapping one party member for another, requipping all their Elements one by one, will kill you just a little bit each time – and as mentioned before, you’ll want to swap party members pretty regularly for the best color matchups against enemies. The option to fill a character’s loadout automatically doesn’t pass muster, as you will almost certainly want to go in and change half of the suggested choices anyway. Am I preserving this idea: HELL no. For this and other reasons that aren’t derived from CC, party members will have no more than about ten “spells” equipped at most by the end of the game. Spells will be reusable within the same battle after a brief cooldown – not the most original game mechanic, but CC was a little bit too original in this area.